The Music Box bring GENESIS’ THE LAMB LIES DOWN ON BROADWAY to the UK for 4 shows in March. THE MUSICAL BOX, the only band in the world to obtain the performing rights and access to the full original archives for "The Lamb Lies Down On Broadway" from Peter Gabriel and Genesis, will perform 4 shows in the UK in March. The critically acclaimed production has been performed with great success in some of the most prestigious venues in the world, such as London's Royal Albert Hall and the Olympia in Paris. In 2005, Phil Collins joined the band on stage in Geneva, Peter Gabriel takes his children to the shows and Steve Hackett has joined them onstage on more than one occasion. Collins once said "I watched and listened. They played that stuff better than we ever did." One of the very first Rock Operas in history, ‘The Lamb Lies Down on Broadway’ was released as a double album in 1974. The tour that followed was a ground-breaking theatrical production, which The Musical Box reproduces in its entirety in painstaking detail. The show is supported by over 1200 original slides, original costumes and props together with an arsenal of visual effects and pyrotechnics. Tickets through www.ticketmaster.co.uk, Tel 08448 844 0444. Doors open at 7pm. All tickets subject to booking fee. 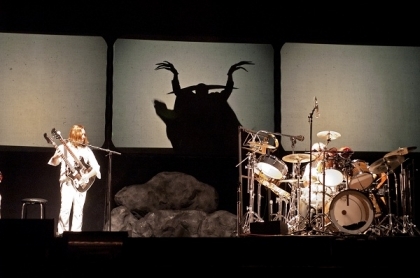 The Musical Box version of The Lamb Lies Down on Broadway debuted in Montreal in October 2000, more than 25 years after the last Genesis performance with Peter Gabriel; the show was sold out and has been going around the world ever since.